Not too long ago I was trying figure out ways to eat more chickpeas and beans in general. I don’t regularly track my macros or food in general. For me it leads to obsessiveness and I try to avoid that if at all possible. I was curious though if eating more fiber and protein would turn me into a super hero of sorts. I only lasted about a week because I ran out of freezer beans, but I did come up with a few good bean recipes, besides eating them straight or adding them to everything I was eating. Salads. Rice. Pasta. One was a sweet take using cinnamon and maple syrup. Very delicious! I will tell you that any time you increase your fiber—digestion issues will occur. The easiest way to avoid that is to slowly increase your fiber over 1-2 weeks and DRINK A LOT OF WATER. The first day I went straight for eating an extra half cup of beans (having already eaten beans with my lunch) and it was uncomfortable. The next day I cut the serving in half and felt much better. 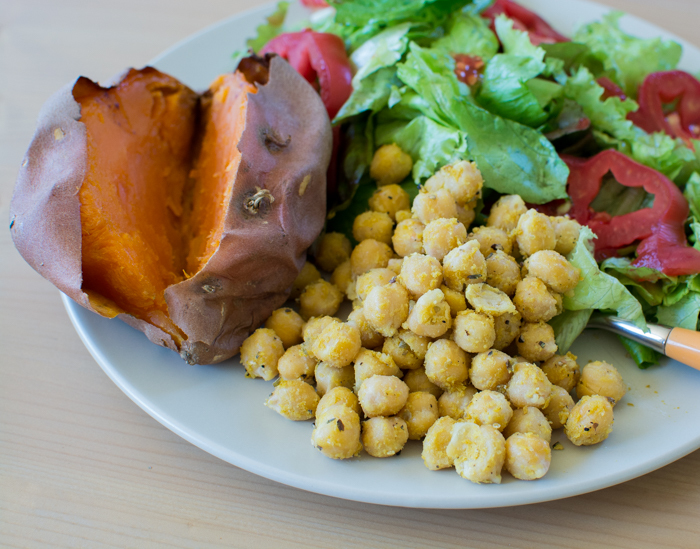 Besides packing in the fiber and protein, beans can be a great source of zinc, calcium, magnesium, iron, potassium, and vitamin c.
I loaded these thawed chickpeas onto a sheet of tinfoil and gave them a few generous sprinkles. I turned the tinfoil sheet into a little pouch and ‘steam’ baked them for 15-20 minutes. They had so much flavor for taking so little time and using only a few seasonings. Toss chickpeas with olive oil (I did it straight on the tinfoil) and sprinkle with seasonings to taste. Toss again to coat. Close the edges of the foil over and wrap/fold until a pouch is formed. Does this picture look familiar?? It’s from yesterday’s post! 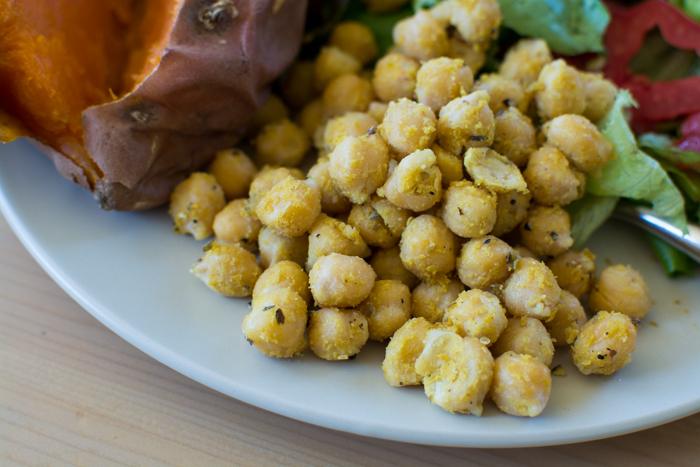 A great cheesy flavor and loads of b vitamins are all thanks to nutritional yeast-aka nooch. This is very similar to the kind of simple lunch I put together sometimes! Chickpeas are great even without seasoning, so they really shine with a little nooch and S&P! 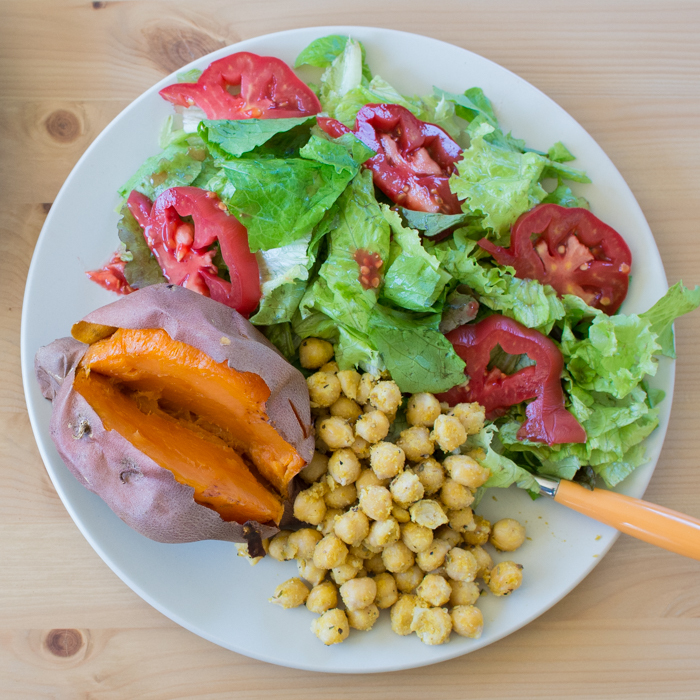 Anything that simple, healthy, and most importantly, covered in nutritional yeast gets my top vote for dinner tonight! I’m getting hungry just thinking about it.